México DF: Reader's Digest México, 2001. This Spanish edition of Reader's Digest Libros Selectos contains a condensed version of Tony Hillerman's novel Hunting Badger. It also contains condensed versions of novels by LaVyrle Spencer, Barbara Delinsky and Jeffrey Deaver. It was published in México DF in 2001. The dust jacket is red and white. 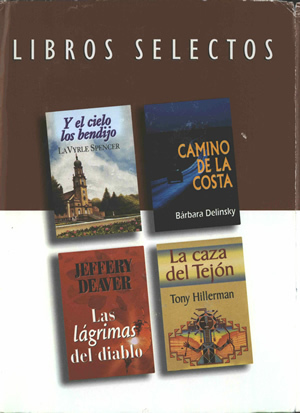 The front cover displays the words "LIBROS SELECTOS" in white on red, above thumbnails of the novels included in the compilation. On the spine, "LIBROS SELECTOS" is printed in white on red, and the titles and author names of the included novels along with the colophon are printed in red on white. On the back cover, photographs of the authors are accompanied by praise for each novel. The front and back flaps of the dust jacket contain synopses of the four included novels. Binding: Brown vinyl-covered boards with logo embossed in the bottom right corner of front cover. The titles and author names are lettered in gold on the spine above the words "Reader's Digest." The endpapers are grey-speckled cream.